Great War, 1914British Red Cross nurse Maria Hunt lives in daily fear that the Germans will uncover her secret: she helps wounded British soldiers escape. Lieutenant John Bennet is wounded and running out of options. Trapped behind enemy lines while collecting intelligence, he needs to get out of Belgium if he’s going to escape with the information and his life. 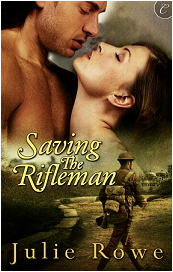 Maria is devoted to her patients and her cause, but something else compels her to risk her life for this soldier. While a man of Lieutenant Bennet’s station would barely speak to her in other circumstances, something in his kind eyes inspires a passion deep within her. But as his injuries worsen, can Maria find the courage to guide him through the war-torn countryside? And should they make it back to England, will their burgeoning desire survive the ravages of war? The 2013 novella category of the Gayle Wilson Award of Excellence! Alarm rippled across Maria’s nerves, jerking her attention from the supply record book she was writing in. Her teacher, mentor and matron of the hospital on Rue de la Culture stood at the window, staring out at the street, her back straight and stiff. “Rose?” Maria took a step toward her, but Rose’s voice stopped her before she could take another. “Please take an inventory of the bandages in the closet on the second floor.” Her words were spoken with a deliberateness that should have been reassuring. It wasn’t. The other woman held herself too still, too rigid. Regular soldiers didn’t make her too uncomfortable, they appreciated the nurses who looked after their wounded countrymen, and they knew they could end up at this hospital and in her care. But the officers were another thing altogether. They looked at Maria and Rose as if the two of them were convicted criminals of the worst sort. As if they were dirty. Herman Geoff was a German doctor, but he treated Rose and even Maria with the utmost respect. His uncle was a high-ranking officer. Very high. As long as Dr. Geoff supported them, they would most likely remain safe. If they did nothing to irritate or anger the local German troops. Something Maria feared she’d already done. She rushed to the back stairs and climbed them quickly. Rose would be safe. The second daughter of minor gentry, she had demonstrated time and again her diplomatic skills were more than up to the task of dealing with arrogant, suspicious German officers. Maria had none of those skills or family background. The second floor was filled with bedrooms, now used as wards for their patients. There was also a room where the nurses slept—Rose, herself, two Belgian nurses and one German nurse who worked with them. A closet near the back stairs had been converted into a storage area for bandages and other medical supplies. Perfect for a woman to hide in while waiting for their German visitors to leave. But the closet was already occupied—by a soldier complete with pack, sidearm and rifle. The weapon wasn’t what snared Maria’s gaze and held it. His eyes were green. A brilliant emerald green. Her breathing stalled as she stood in the doorway and stared into those wide, pale eyes and at the blood spattered across his face and uniform. His British uniform. In a Belgian hospital full of enemy German soldiers. Voices floated up the back stairs a few feet away and she opened her mouth to caution him. Before she could utter a warning, before she could blink, his hands reached out, grabbed her and yanked her into the closet, pulling the door closed behind. Fear and shock crushed her throat as she found herself pressed against the soldier’s body, one of his hands over her mouth, the other a steel band behind her back. She couldn’t move and the closet was so dark it might as well have been a tomb. Blind and restrained, the unfamiliar scents filling her nostrils took over her senses.